The Karen National Union (KNU)’s Win-Yay Township in Dooplaya District released a notification to the local authorities on December 29 to negotiate with them, on the issue of electing new village administrators in Kyain-seikgyi Township, Karen State. P’doh Saw Maung Shwe, chairman of the KNU’s Win-Yay Township, told Karen News on December 30 that the notification letter was issued due to lack of instruction for cooperation with the KNU over this issue. “We let know [the local authorities] as they failed to negotiate with us on electing new administrator. Negotiation must be held in line with the NCA (nationwide ceasefire agreement). It seems politically limited. Such kind of action seems disregarding the village administrators elected by the KNU a year ago,” he explained. Bilateral coordination has been specified in Section 25 (c) of the NCA. However, the government did not issue any instructions for coordination with the KNU. So, the KNU urged the local authorities to negotiate with them in order to avoid wrong procedures in the election and walk towards the peace goal together, according the KNU Win-Yay Township’s notification letter. 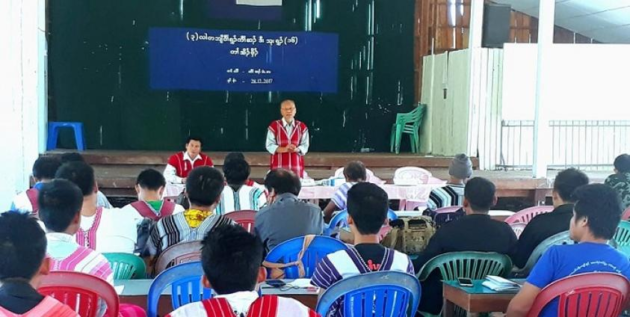 Kyain-seikgyi Township has village-tract administrators elected by the government as well as there are village-tract administrators elected by the KNU and the New Mon State Party (NMSP) in the areas under their controls, respectively. Saw Yaunt Thar Eh San, a youth poet, told Karen News that he wanted the authorities to launch the election after negotiating between those groups due to conflicts among the local residents on legal and socio-economic issues. Supervisory boards have been formed to hold the village administrator election in 49 out of 51 village-tracts in Kyain-seikgyi Township and the election will be held within January, according to the township officials.